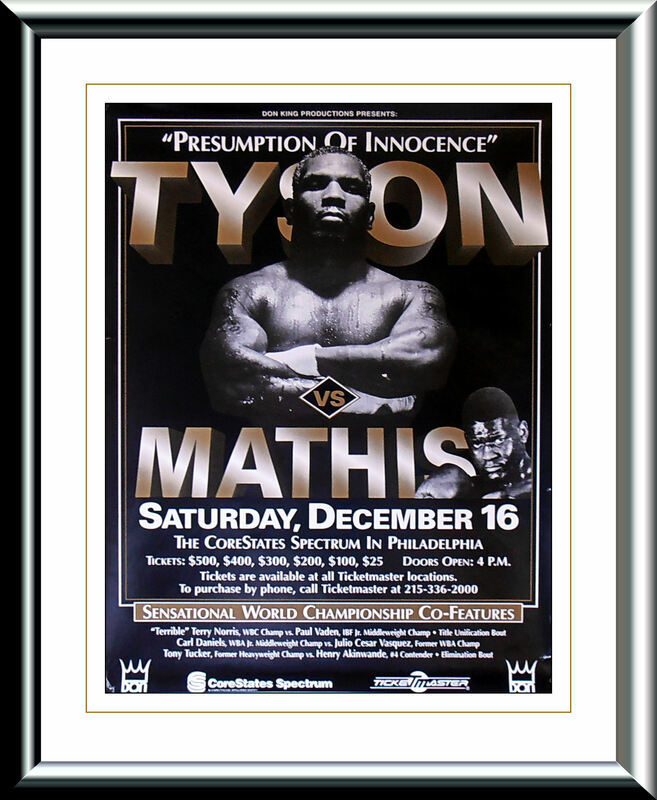 Description : Here we have the original Don King production onsite poster for the Mike Tyson v Buster Mathis Jr fight that was held at the Core States Spectrum Centre, Philadelphia on December 16, 1995. Mike Tyson had returned to boxing after a three-year prison stint with an 89-second victory over Peter McNeeley. After his victory, Tyson's rank as the number one ranked heavyweight was restored by the three major boxing organizations (the WBA, WBC and International Boxing Federation). Before he would fight for one of the three World Heavyweight titles, he would first partake in second comeback fight. 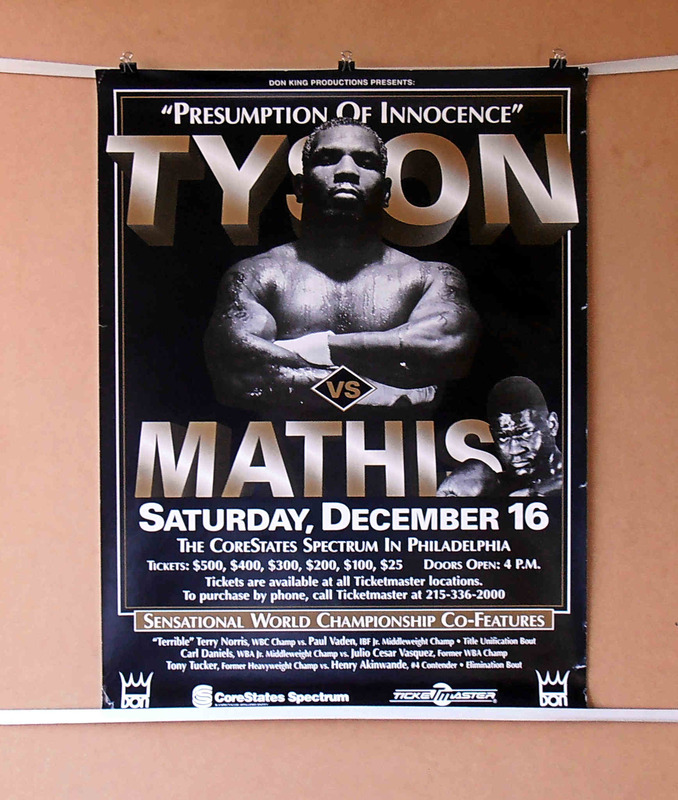 Only days after his victory over McNeeley, it was announced that he would face the undefeated but virtually unknown Buster Mathis, Jr. on November 4, 1995 at the MGM Grand Arena.Three weeks before the fight, Tyson suffered a broken thumb, but did not announce it until November 1, three days before the fight. In a press conference at the MGM Grand, Tyson announced the cancellation of the fight because of the injury. Then, on November 22, it was announced that the bout had been moved to Atlantic City with a December 16 date. Tyson had a slow start in the fight. 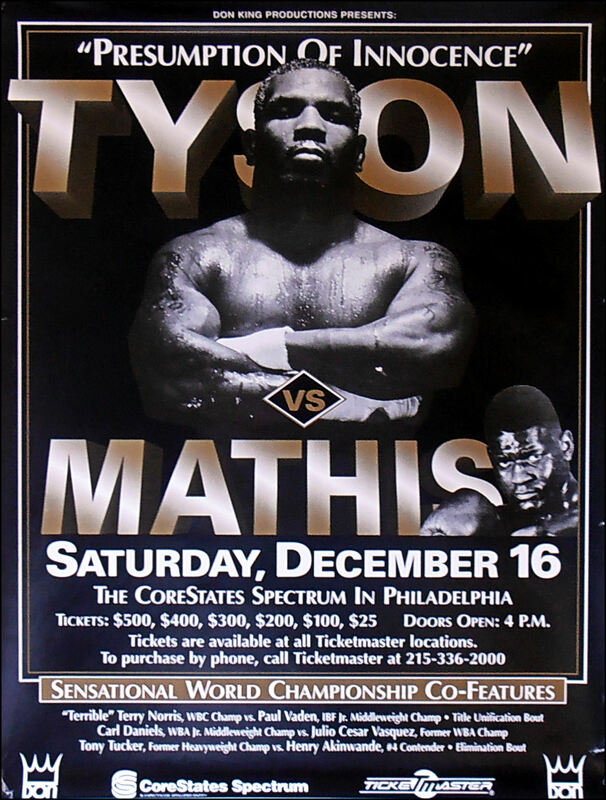 In the first round, Tyson was unable to land many punches as Mathis was able to dodge most of Tyson's attempts while also staying close to Tyson to prevent Tyson from unloading his power punches. In the second round Mathis successfully continued to use his defensive strategy of slipping, bobbing and clinching to survive the round. However, with about 40 seconds left in round 3, Tyson was able to land successive right uppercuts that dropped Mathis to the canvas. Mathis was unable to answer the referee's 10 count and Tyson was awarded the victory via knockout. Condition : Very Good / Minor handling & general edge wear / few nicks to sides, checkout live photo/Framed 4 display only!